The Glenn Beck Review: Beck on the Jesus pancake: "I don't want to question God." Beck on the Jesus pancake: "I don't want to question God." During his Restoring Honor event on the Washington Mall in 2010, Glenn Beck misquoted Thomas Jefferson saying, "Question the very existence of God, for if there be a God, He must surely rather honest questioning over blindfolded fear." This morning, he forgot the questioning of God, even though Beck has used that altered quotation many, many times. "I don't want to question God." Actually, Jefferson never uttered or penned the phrase "...rather honest questioning...." That misquote was one of two subtle deceptions made during his "Restoring Honor" speech. Beck embellished or altered the facts that afternoon after first stating, "Our sacred honor. It means that you tell the truth. The whole truth and nothing but the truth." 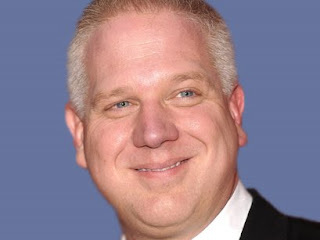 A critic could argue that Glenn Beck is a fraud who lies and blatantly contradicts himself. A supporter of Mr. Beck would explain that he was...what? Forgetful? They always have an excuse, deflect ("Obama's a liar, but he's the President!") or they attack the critic. Like Glenn Beck himself, they have the opportunity to explain this theological contradiction in a comment below. A masterful propagandist for the corporate-state, skillful orator and freak of media.